DENVER – Blizzard warnings were issued Tuesday afternoon ahead of the incoming snowstorm , which is expected to pack several inches of snow and wind gusts of up to 60 miles per hour Wednesday into Thursday morning across much of northeastern Colorado. The blizzard warnings are in effect from noon Wednesday until noon Thursday for most of northeastern Colorado, including Denver, Fort Collins, Greeley, Castle Rock and most of the counties in the region. LIVE BLOG: Click here for live updates Wednesday as the blizzard moves into and through Colorado. Travel along I-70 and I-76 east and northeast of Denver is expected to become hazardous, if not treacherous, during the storm. Forecasters have said that another “bomb cyclone” could build over the Midwest and could be centered in the western Kansas and Nebraska area. The storm would become a bomb cyclone if the sea level air pressure drops at least 24 millibars in a 24-hour period. 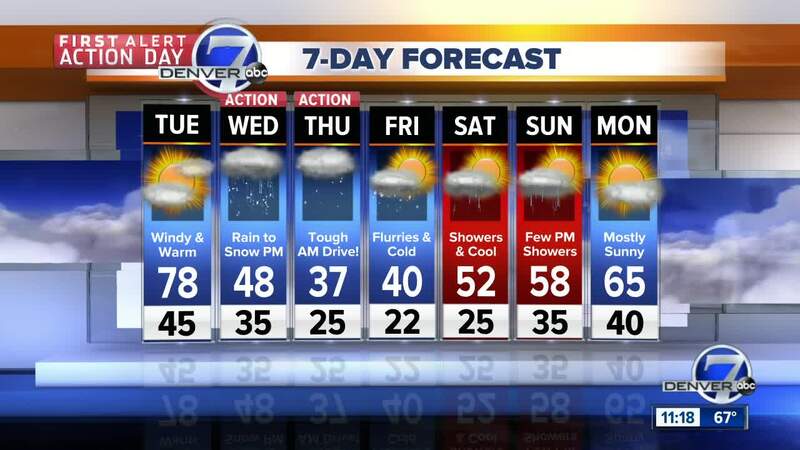 The blizzard will come after two days of high temperatures in the 70s across the Front Range. Rain will likely come first with the storm Wednesday morning and is expected to transition to snow around midday. The snow will continue overnight and into Thursday morning, when travel is expected to be slow across much of the state and road closures could be put in place. There was a gamut of weather warnings and advisories Tuesday ahead of the storm: blizzard warnings are scheduled for northeastern Colorado; winter storm warnings are in place for the mountains and Western Slope; high wind warnings are in place in southeastern Colorado, as a red flag warnings across the eastern and southern half of the state. The I-25 corridor is expected to receive between 4 and 8 inches of snow in the storm, while the foothills and mountains could see more than a foot. Far northeastern Colorado could receive closer to a foot of snow as well, according to forecasts. "This is the time of year when we get a roller coaster of weather," Colorado state climatologist Russ Schumacher told The Associated Press on Monday. 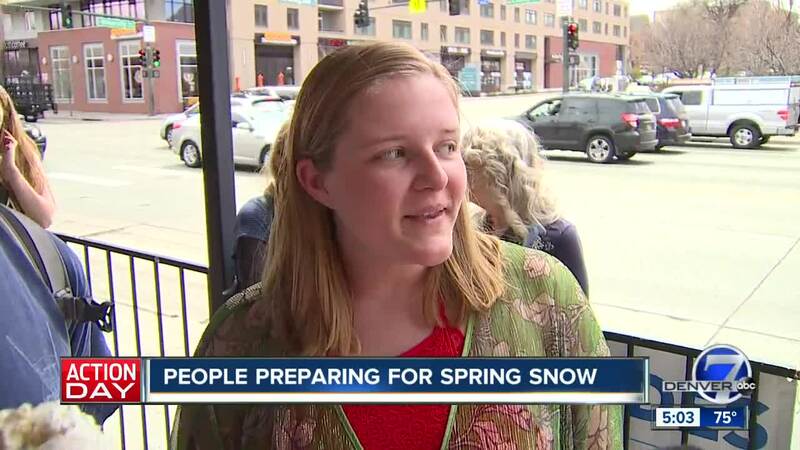 "Going from 80 degree temperatures one day to a snowstorm the next is not that out of the ordinary, especially in March and April, around here." The National Weather Service in Boulder warned ranchers and cattlemen Tuesday to bring their livestock to shelter by Wednesday morning if possible in order to protect them from the blizzard conditions. Delta Airlines has already issued a weather waiver bulletin for April 10-11 for the storm at DEN (Denver), ASE (Aspen), COS (Colorado Springs) and GJT (Grand Junction). Delta travelers can request waivers by clicking here. United Airlines has also issued travel waivers for the same dates. Highs in Denver are expected to approach 80 degrees Tuesday but will continue to fall as the storm approaches. Wednesday’s high will likely be set just after midnight as temperatures continue to fall, and the day’s low is expected to be in the mid-20s by Wednesday night. Snow could continue into early Thursday afternoon, when highs are only expected to top out in the high-30s or low-40s.